View More In Stands & Mobile Bases - Page 4. 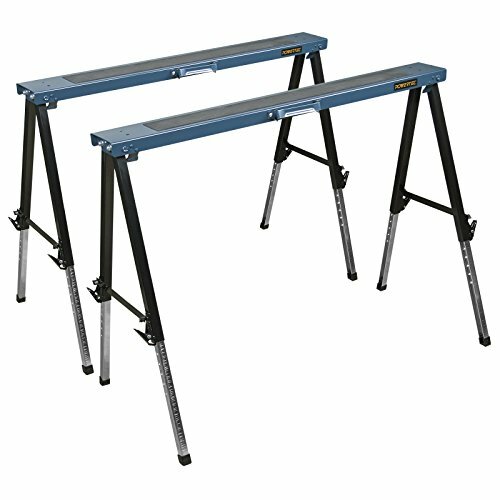 Compact and all-purpose, the POWERTEC UT1005 Heavy-Duty Folding Leg Portable Saw Horse, 2PK, serves as both a solid support base for holding/stacking your lumber or materials, and a rugged, stable work platform for your benchtop operations. With collapsible legs and a large carrying handle, this efficient stand design offers easy transport and storage. Its telescoping, spring-loaded legs also securely lock to insure dependable rigidity, and can be height adjusted at twelve customized settings. The wide, rubber-topped, nonslip surface insures the optimally secure placement of your stock. Ultra-strong steel construction allows for use, in even your most demanding applications. Designed for easy setup, breakdown, usability and portability, it is the perfect addition to your workshop assembly. Pre-drilled mounting holes facilitate simple transform from saw horse to workbench capability. Comes in handy 2PK.